Both sides of the world come to the critical points of market reversals, but they are pointing in exactly opposite directions. The U.S. broad stock market is facing a potential bearish breakdown from a head-and-shoulders top, while the Chinese stock market is facing a potential bullish breakout from its head-and-shoulders bottom. Crude oil broke down sharply and led commodities decline, while gold hesitated and went nowhere. get bigger and bigger, price movement becomes volatile usually with increasing true ranges. Neither bulls nor bears can declare a trend before a breakout or a breakdown from the wedge. The current broadening wedge on the S&P 500 index had an upswing started on 4/24/2014. But the upswing changed course at 1415 before it reaches the upper boundary of the wedge, and it became a partial rise (see here) inside the broadening wedge. In general, partial rises appear at the end of broadening patterns and suggest an immediate downward breakout. 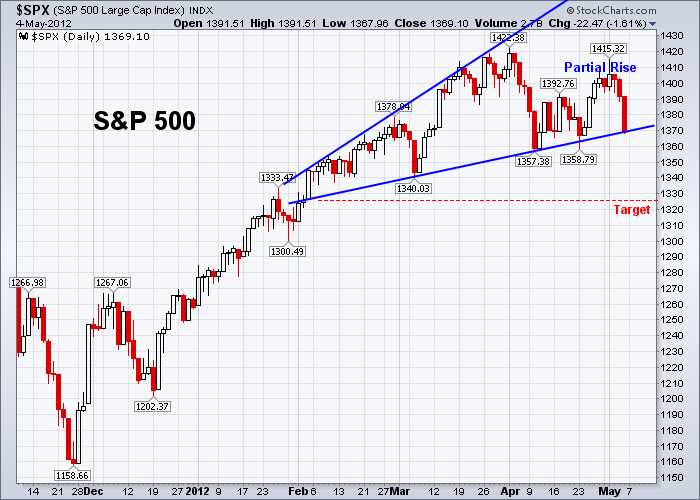 Friday the SPX closed right at the lower boundary of the wedge. If it breaks through also closes below the lower boundary, the price could have a further decline with a downside target around 1325 which is projected by using the lowest valley in the broadening wedge. 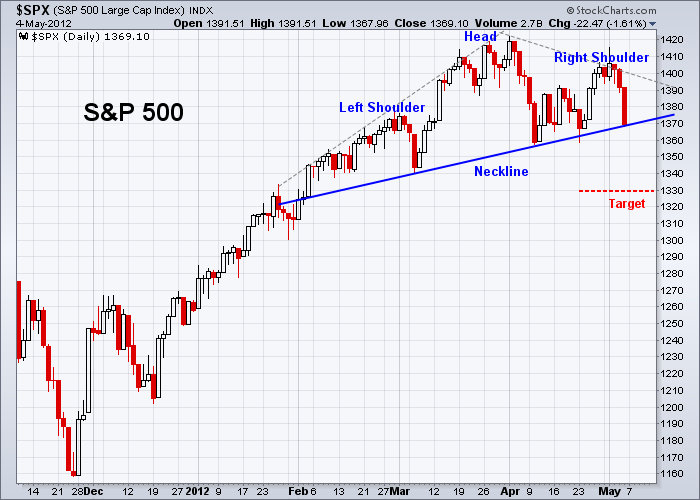 The SPX also formed a three-month Head-and-Shoulders top pattern, and it closed right above the neckline on Friday. This pattern is a bearish reversal pattern and would be confirmed once prices break down the neckline and close below the pattern. According to Bulkowski’s measure rule (see here), from the head price (1420), the neckline price (1350), the target meeting rate (55%) and the breakout price (1369), the downside target price could be derived as 1369 – ( 1420 – 1350 ) x 0.55 = 1330. 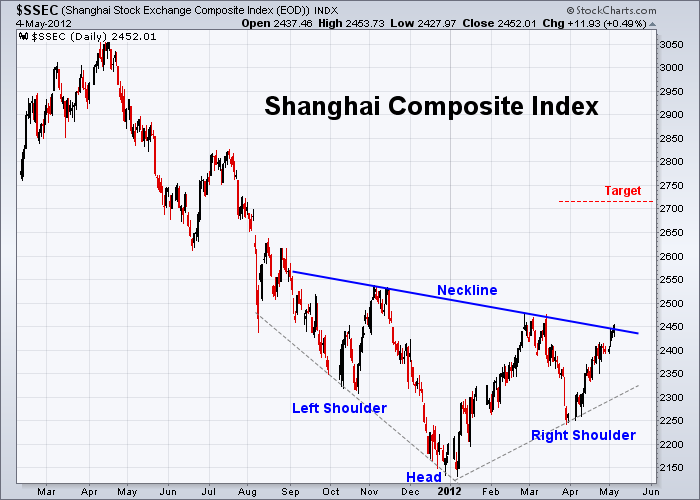 It is interesting to find that the Shanghai Composite Index is in an exactly opposite situation. It formed an inverse Head-and-Shoulders pattern, also closed right at the neckline on Friday. This pattern could be a bullish reversal pattern once prices break out and close above the neckline. According to Bulkowski’s measure rule (see here), from the head price (2150), the neckline price (2500), the target meeting rate (74%) and the breakout price (2450), the upside target price could be derived as 2450 + ( 2500 – 2150 ) x 0.74 = 2709. There is a recently appeared inverse relationship between the Chinese market and the U.S. market. Especially this week the Chinese market became leading in the BRIC performance ranking (see the last table below) and the Chinese market became outperforming the U.S. market first time since last September. 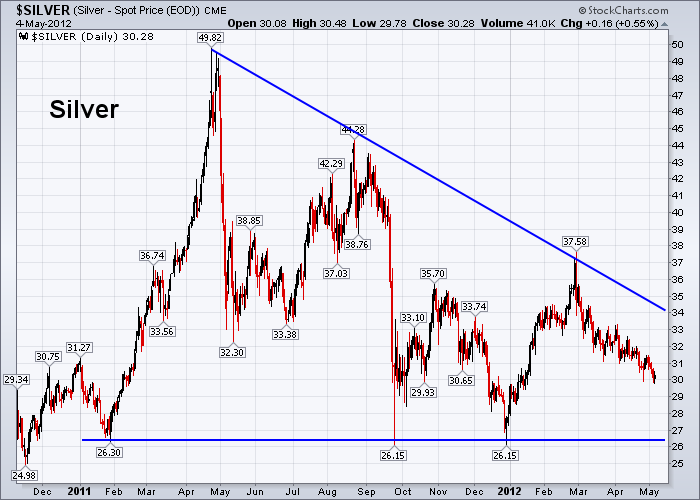 The gold index has been in an intermediate-term “Bump-and-Run Reversal Top” pattern (see here). 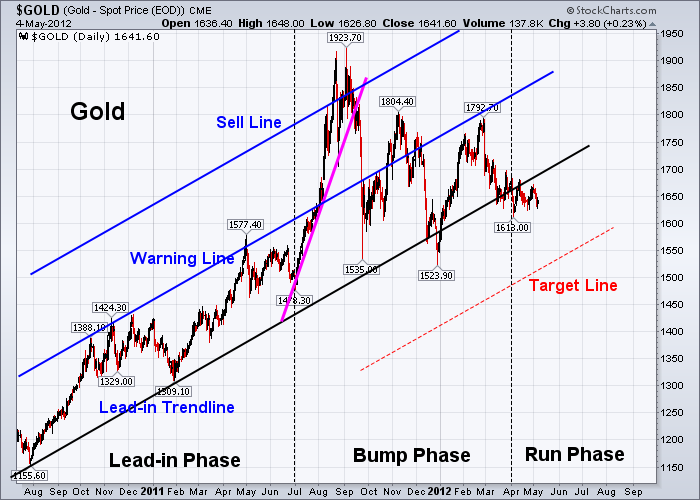 Currently it is below the “Lead-in Trendline” and it is in the “Run” phase. The typical characteristics of the “Run” phase is a downhill run for price movement. The downside price target could be around 1500 for support from the target line. Between the bearish bias from the current crude oil led commodities weakness and the bullish bias from the Chinese stock market bottom reversal, gold is in a hard time to figure out its way to go, especially when gold mining stocks are falling. 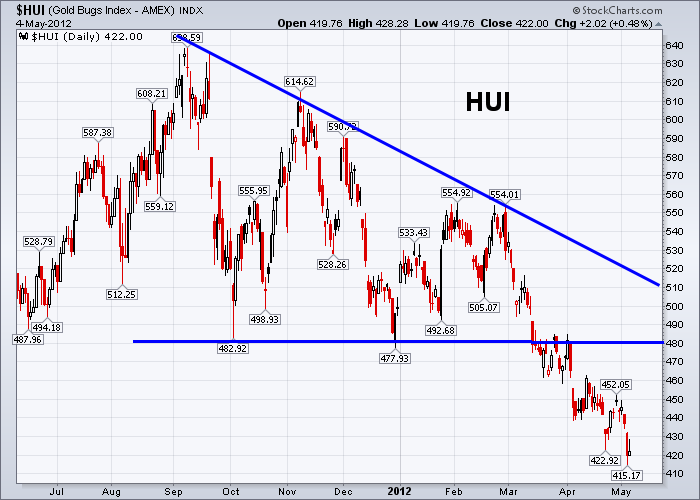 As I mentioned on 4/7/2012, both XAU and HUI have broken to the downside from their 7-month descending triangle patterns (see here). The descending triangle is a bearish formation confined by an upper descending trend line and a lower horizontal line. Once a downside breakout occurs, a price target is projected by measuring the widest distance of the pattern, multiplying it by 54% price target meeting rate, and subtracting it from the breakout. 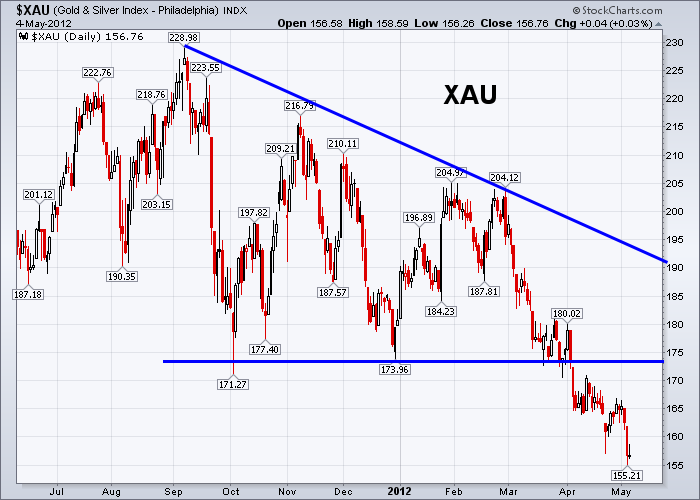 Therefore, XAU could fall to 144 and HUI could fall to 400. Both should decline about 17% measured from the breakout. The gold/silver mining sector currently has the lowest performance rank in comparison with all other sectors (see the table of sector performance ranking in the bottom). Since April of last year, the silver index has formed a Descending Triangle pattern (see here) with a falling resistance line and a horizontal support line. The descending triangle generally appears in downtrends. Price movement is choppy between the two boundary lines before a breakout or a breakdown from the triangle. 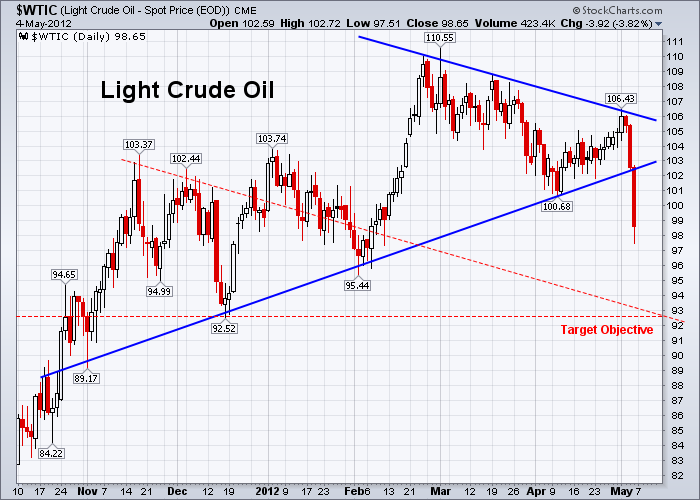 The crude oil broke out to the downside sharply from a symmetrical triangle pattern last week. The downside price target is projected at 92.50 as shown in the chart below. 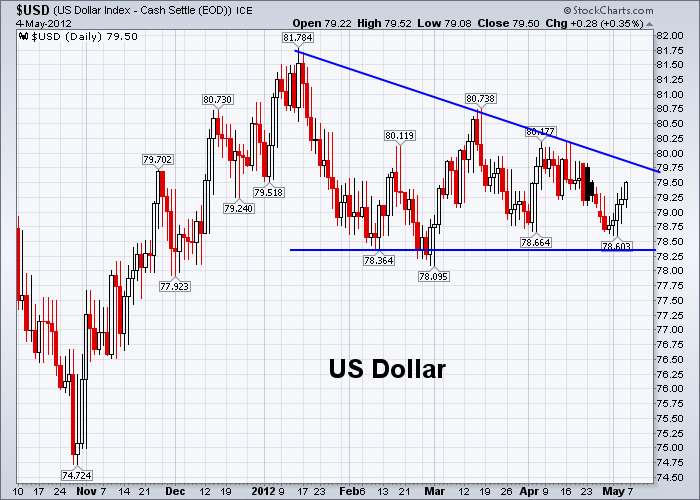 The US dollar index changed to a Descending Triangle pattern last week. Currently it is neutral inside the triangle before a breakout from either direction. Since last August, the 30-Year US Treasury Bond index has been range bound in a horizontal channel or rectangular pattern between the upper boundary at 146 and the lower boundary at 135. Currently prices are in the upper half of the trading range. The following table is the percentage change of each asset class (in ETFs) against the 89-day exponential moving average (EMA89). 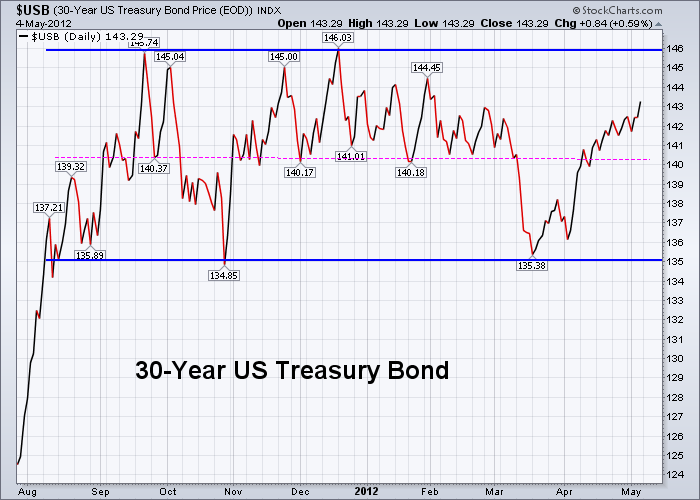 Currently the U.S. Treasury Bond is outperforming. Crude oil is underperforming. The following table is the percentage change of sectors and major market indexes against the 89-day exponential moving average (EMA89). 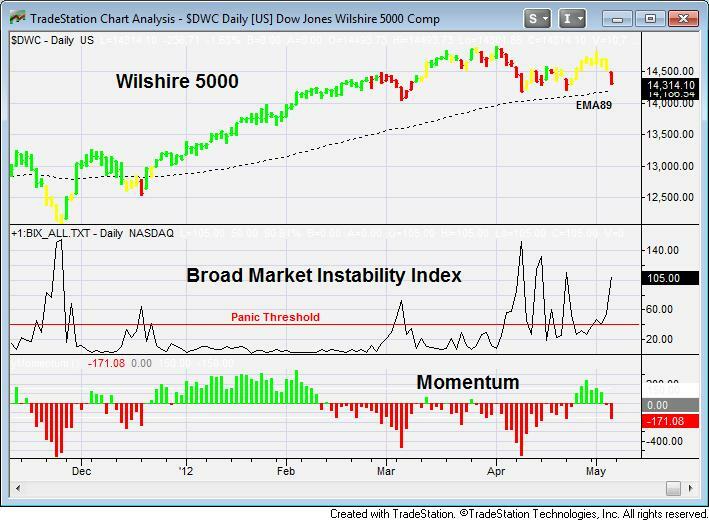 The Dow Jones Wilshire 5000 index, as an average or a benchmark of the total market, is 0.90% above the EMA89. Outperforming sectors are Real Estate (4.72%), Biotech (4.39%), and Telecommunication (3.86%). 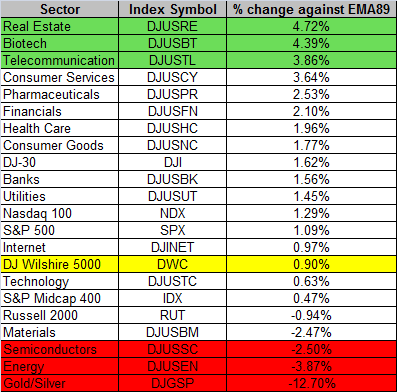 Underperforming sectors are Precious Metals (-12.70%), Energy (-3.87%), and Semiconductors (-2.50%). The Dow Jones Industrial Average (1.62%) is outperforming the market, and the Russell 2000 Small-cap (-0.94%) is underperforming. The table below is the percentage change of the BRIC stock market indexes against the 89-day exponential moving average (EMA89), also in comparison to the US market. The Chinese market is outperforming and all other BRIC markets are underperforming.